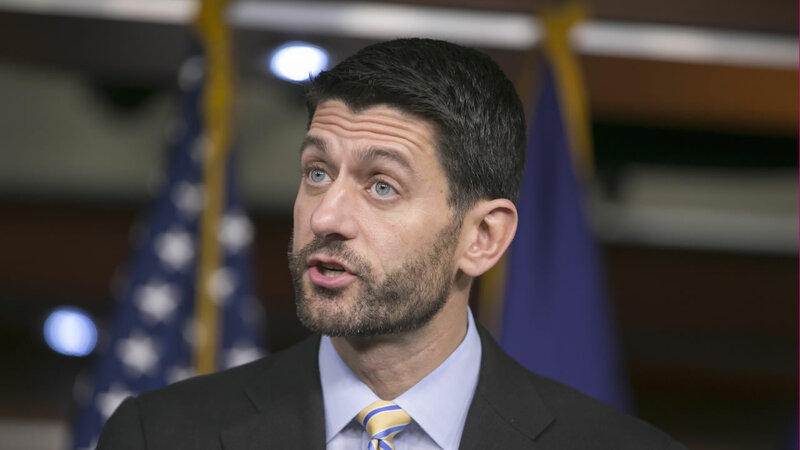 WASHINGTON -- House Speaker Paul Ryan announced late Tuesday an agreement between congressional leaders and the White House on a year-end tax and spending package that would fund the government through the 2016 budget year, raise domestic and defense spending, and increase the deficit by hundreds of billions of dollars by extending numerous popular tax credits without paying for them. Ryan announced the deal in a closed-door late-night meeting with GOP lawmakers. He urged Republicans to support it even though it's a compromise containing plenty of wins for Democrats. He said Republican victories are reflected, too, including lifting the four-decade-old ban on exporting U.S. crude oil. "This is divided government," Rep. John Kline, R-Minn., said coming out of the meeting. "If you're going to move forward and follow Speaker Ryan's notion that we move onto offense next year ... Let's put 2015 behind us and move onto 2016." Democratic aides cautioned final language was still being worked out. Republican leaders predicted the package would come to a vote in the House and Senate on Thursday, allowing lawmakers to head home for the holidays having completed their needed tasks. First they will have to pass yet another short-term government funding extension, since the current one runs out Wednesday at midnight. "In negotiations like this you win some, you lose some," Ryan, R-Wis., said earlier in the day at an event hosted by Politico. "Democrats won some, they lost some. We won some, we lost some." Eleventh-hour negotiations twisted and turned on the mammoth deal pairing the $1.1 trillion spending legislation with a giant tax bill catering to any number of special interests. The deal, Congress' last major piece of unfinished business for the year, became the vehicle for countless long-sought priorities and odds and ends, including reform of visa-free travel to the U.S., renewable energy tax credits and health benefits for 9/11 first responders. Democrats, despite their minority party status in Congress, exacted a price in the negotiations, thanks to President Barack Obama's veto pen and Republicans' need for their votes on the spending bill. "We may not be in the majority but we're feeling that these goals are on track," boasted Sen. Chuck Schumer, D-N.Y.
Last-stage negotiations focused on horse trading around Democratic demands in exchange for lifting the 40-year-old ban on exporting crude oil, a Republican goal. Democrats succeeded in killing GOP attempts to roll back Obama environmental regulations, and obtained extensions of wind and solar tax credits, and permanent extension of the child tax credit. From the White House, press secretary Josh Earnest sounded resigned to Obama signing a bill lifting the crude oil export ban despite previous threats to veto the measure as stand-alone legislation. The export ban was imposed during energy shortages of the 1970s but has been declared outdated by industry allies. Environmentalists say lifting it would amount to a giant windfall for the oil industry. "I'm confident that there will be things that will be included in the omnibus bill that we don't support," Earnest said. "I don't know if the lifting of the export ban will be among them, but our position on this is pretty clear." The final package ignored conservative demands for language clamping down on Syrian refugees entering the U.S. Instead it contains changes tightening up the "visa waiver" program that allows visa-free travel to the U.S. for citizens of 38 countries, including France and Belgium, where many of last month's Paris attackers were from. Also in play were about 50 lapsed and expiring business and individual tax breaks that the two sides were looking to extend, in some cases permanently. The price tag could mushroom to several hundred billion dollars or more over a decade, which would further add to federal deficits. The two sides agreed to make some expiring business tax credits permanent in exchange for doing the same to tax breaks for children, college students and lower-earning families. Senate Majority Leader Mitch McConnell, R-Ky., said such a deal would make a larger tax reform package easier to achieve next year, while satisfying business goals, including extending a research and development tax credit and a popular deduction for equipment purchases. "Making those permanent is, I think, an important shot in the arm to our economy," McConnell said at the Politico event.